June 2010 | Tired, Need Sleep. The subtitle for this book is “Discovering the Secret of a Man’s Soul”. Well, what woman with husband and son wouldn’t appreciate knowing the secret of a man’s soul?! I was really looking forward to reading this book. The main point of this book, as I see it, is that men and boys have the need to be the hero. They want to be brave and strong and adventurous. This is all well and good and it has helped me understand my husband’s “need” to go hunting each fall, as well as my son’s need to play just a little on the dangerous side sometimes. They want to be challenged, and know that they are up to the challenge. However, the author went a bit overboard in my opinion. His tone throughout the book seemed a bit derogatory towards “nice guys” who go to church – suggesting that they are bored, and that you can tell this simply by going to church and looking around. Honestly, what is a man in church supposed to be doing that would make him seem more manly? In my opinion, simply being there and being a role model to his children, is manly. He mentions Mother Teresa in a couple of passages. Once, when talking about the fact that many portraits of Jesus show him as being gentle and kind - “Kind of like Mother Teresa.” Then he writes, “Telling me to be like [Jesus as pictured], feels like telling me to go limp and passive. Be nice. Be swell. Be like Mother Teresa.” How limp and passive was Mother Teresa?? I found this very insulting, and also proof that the author knows nothing about Mother Teresa and her courage. How “nice” and “swell” was she in her Nobel award speech? She had to have great courage to go among the poorest of the poor, tending lepers and other outcasts. He does go on to say that Christ is the incarnation of tender mercy, but also brave enough to take on the Pharisees when they needed correction. This, I suppose, is what all Christians are called to be – tenderly merciful when needed and brave when needed. There were several things in the book that I felt were thoughtlessly written, but I don’t have the room to put them all down here. The book was peppered with movie quotations and scenes, used to help explain the author’s view of what lies in a man’s heart… movies like Braveheart, Legends of the Fall, and Gladiator. I haven’t done a count, but I feel like he used movies much more often than scripture passages to make his points. It seemed a little strange to me that he would use movies made by fallen humans to describe God’s intention in creating men. Unfortunately I can’t recommend this book, unless one is willing to skip over half of the nonsense in it in order to learn something worthwhile about the men in their lives. Thank you to Thomas Nelson Publishers for sending me a free copy of this book to review. More great picks from M last week for his art box – he chose part of an egg carton, a box of collage thingies, feathers, electrical tape, a small paint roller, dot stickers… and a lot of other things I can’t recall. He’s an art maniac. I’m sure this phase will pass though, so I’m trying to enjoy it! Remember how I couldn’t get him to do many bug crafts a couple of weeks ago? Well one was a caterpillar from an egg carton. He was not. interested. No way. But of course when it’s his idea, he’s all over it. He thoroughly enjoyed making this caterpillar. If you can call it a caterpillar, because, you know it has feathers and two faces. But ok, it’s a caterpillar. He also had a fun time making tape resist paintings with the electrical tape. I did this one time with him as a structured art project, and he’s never forgotten it. Thanks you for all the encouraging comments last week. I was honestly expecting to hear that no one is interested, and your comments really meant a lot to me. I’m feeling very blessed by all my online friendships. Thanks, everyone, I appreciate you so much! If you have a post you’d like to link up, look below! Do Simplicity, Focus, and Recollection Characterize your life? No? Huh. Mine either. But it kind of sounds nice, doesn’t it? This is a question that I’ve been thinking about lately, and it came from a list that is used as an aid in an Examination of Conscience. An Examination of Conscience is pretty much what it sounds like – taking a few minutes at the end of the day to think about the choices and decisions you’ve made throughout the day, as well as your thoughts and actions, and seeing how they line up with what you believe is God’s will for your life. Some things are pretty easy – the next time M sprinkles glitter all over the kitchen floor I’ll try to remember gentleness and patience are a better path to take than yelling and turning into Crazy Mommy. And some things take a bit more soul-searching – did I spend my time wisely today? Did laziness keep me from completing all the *reasonable* duties of the day, or was I honestly trying to do too much? It’s nice to do this on a daily basis – improvement in our (my!) spiritual life will only happen if we are conscious of our weaknesses. The main thing to remember in order to not get discouraged when I have several bad days in a row is that there is always grace. Grace to start over again, and get back on track. Do I live a blanced and integrated life? Do I recognize the signs of imbalance? What is a healthy pace of life for me? Am I gentle, especially in teaching and in giving correction? Do I find myself preoccupied with what others think of me? Do I aim at excellence in those things God has given me to do? Am I at home with silence? Life never seems simple, but why shouldn’t it be? Why shouldn’t we be tranquil and given to contemplation? Why should it be so hard to just say no to some things? I love to plan. I actually have been known to spend so much time and energy in making plans that I’m worn out before we even begin doing anything. I think having a plan for our days is a good thing, to the extent that it brings a sense of order to our life and our home, and leads to simplicity and peace. However, this is seldom the case with my planning, and I know I’m not alone here. Why does having a plan have to mean enrolling my child in every available activity this summer, and then spending time rushing around everywhere? Sometimes we moms even get anxious if we are facing time alone with our children and have no set plan. I guess that’s my teaser for the series I’ll be writing detailing these changes. Stay tuned! I found the recipe for this salt ceramic mixture in MaryAnn Kohl’s book Preschool Art. She didn’t mention using it to make a paperweight, but she did say it will dry “rock hard” without baking. Perfect. After it’s cool, knead it several times until it’s pliable and soft. It will be a tiny bit sticky, but that’s ok. This recipe made a ball about the size of a large grapefruit. I separated it into 3 parts and rolled each part into a ball. I gave him a variety of items to press into the paperweights – buttons, sea glass (from a stepping stone kit we did a long time ago), seashells, flat glass pebbles, and colored macaroni. We took the balls of dough out of the baggie, then slightly flattened each one. M had a great time choosing things to press into the dough. He got a bit more elaborate with each one. These really turned out nicely. You can’t tell in the photos, but the salt gives a bit of a sparkle. The sparkle, along with the whiteness of the dough, makes it look kind of “beachy”, so the shells and sea glass really look nice in it. They are like mini beach-scapes. I think this “salt ceramic” would work nicely for handprints too, and could even be painted after it dries. Another week of letting M choose his own art box supplies… I am going to have to limit him to 4 or 5 items per drawer (so 8 to 10 items total) I think, because he just grabs and grabs and grabs, and it ends up looking like this: And honestly, I’m not sure what all was there! He was a busy, busy boy! He was in love with the little sticker roll he’s holding in the above picture. He called it his “sticker machine” and used up the entire 200 stickers. Yep. 200. Thankfully I’ve had them for ages, not knowing what to do with them, and they only cost $1.00. 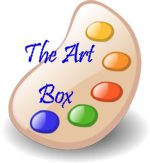 I’ve been thinking of ending my little Art Box series on here because, really, how interesting is it (to someone other than Mama) to see hundreds of paintings and collages made by a 3 year old? And interest in the link-up seems to have waned (which is fine, I’m just sayin’)… but I realized what wonderful memories of this time I have from these posts. M has been nothing if not a creative and artistic little guy; I remember when he was 1 year old and hopping mad about something (who knows what) and after crying and screaming about it, all he wanted was “paint!” “red!” :) He expresses himself so easily with art, and I love looking through his artwork and seeing how he’s progressed. Speaking of recycling, sometimes it irks me a bit when he uses entire sheets of foam in a collage, like this: or those perfectly good pipecleaners, or whatever. I must say if it’s not a work of art that we intend to keep I eventually strip it of all useful and reusable items before tossing it. He has no idea how many times he’s used those buttons and craft eyes, etc. Thoughts or opinions about continuing to make this a linky? Let me know in the comments! I’m fine with these posts being just for my memories, with the hope that others will get ideas of what to supply their preschoolers with. If you do have a post you’d like to link up… it’s below! We finished our bug unit a couple of weeks ago, but… life intervened and I haven’t had a chance to write it all up until now. I use the term “bugs” to mean any creepy crawly thing, so although we talked about how spiders are not really insects, we still included quite a few spider-ish activities. I found an amazing bug book at a garage sale over a year ago. It includes a tray of bug parts that snap onto each page. You can create the bugs that are described, or use the pieces to make a weird bug creation all your own. M had a blast with this book! I found some storyboard pieces here that go with the book, The Very Hungry Caterpillar, by Eric Carle. I made them into magnets and M had fun retelling the story with them. I made a file folder game, inspired by this one at Mama Jenn’s blog, but using butterflies from Prekinders that I had already printed out. The idea was to match up the halves. We talked about how butterflies are symmetric, meaning each wing is a mirror image of the other. M understood this, but was completely NOT into this activity. I’m not sure if the more muted colors were not to his liking, or if it was a bit overwhelming – it is a pretty tough visual discrimination activity, with many looking almost alike, but not quite. Or maybe he’s just tired of this sort of thing. I put these little foam capsules out for him and he enjoyed watching them open up in warm water. This time we used pretty hot water and he took them out with tongs. They dissolved so much more quickly than they have in the past with only lukewarm water. These were all bug-shaped and we identified each one, then made them into stamps by gluing them onto peanut butter lids. We played some basic grid games using bug grids that I made and printed out. These can be downloaded here. These are great for math and reading skills! Going from left to right and top to bottom mimics the movement of reading. He loves doing these – we just roll the die and stamp out that number of bugs. Look at that face… bored out of his mind! :) Oh well, I try to not let this kind of reaction discourage me. 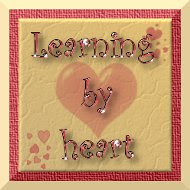 Writing these posts helps with that, because I can see how many things he really enjoyed and learned! I’m linking this post up to Preschool Corner and Weekly Wrap-Up – check them both out for some great activity ideas!